I have to say that I really love the intuitiveness and simplicity of ICRPG! These days I rarely get together with a regular group of adult gamers. More often, I’m playing RPGs with my boys who are just beginning to hit the age where I first started playing D&D. I did, however, start them off playing Savage Worlds. 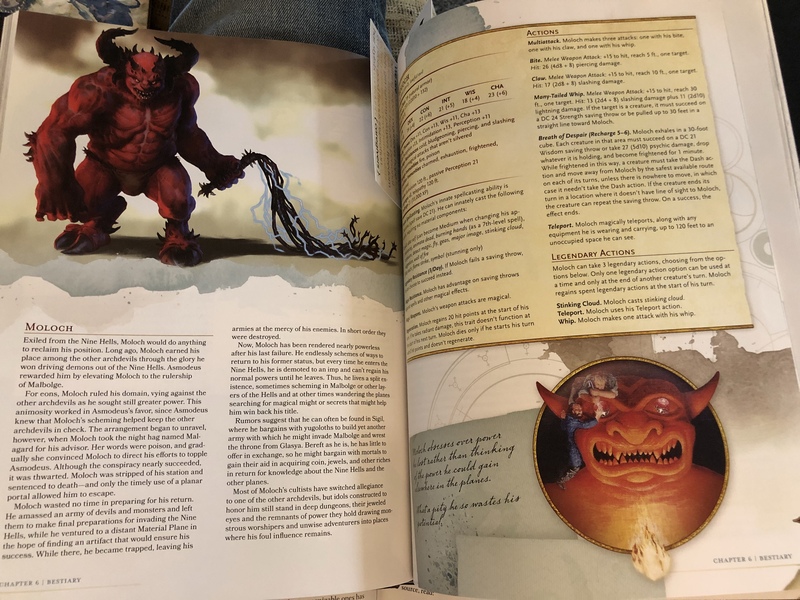 I remember when I first tried to introduce them to 5e via “The Lost Mine of Phandelver”, my son missed one of his first rolls and exclaimed, “I want to spend a Benny!” Ooooo! Sorry, son, there aren’t any Bennies in 5e . . . until now. I ran my first session of ICRPG using Hankerin’s rules for Hero Tokens and the continuous clockwise rotation, but I sure did miss SW’s Initiative and Benny system. We ran that game with no prep. We just used Hankerin’s art and some Rory’s Story Cubes to just create a cool story. I decided to try out ICRPG using a D&D module and incorporating some SW-inspired home brew rules. To the left of the pencil I have some large, steampunk tokens that I’m using for my Hero Tokens. Each player gets one and can use it for Maximum Effort. 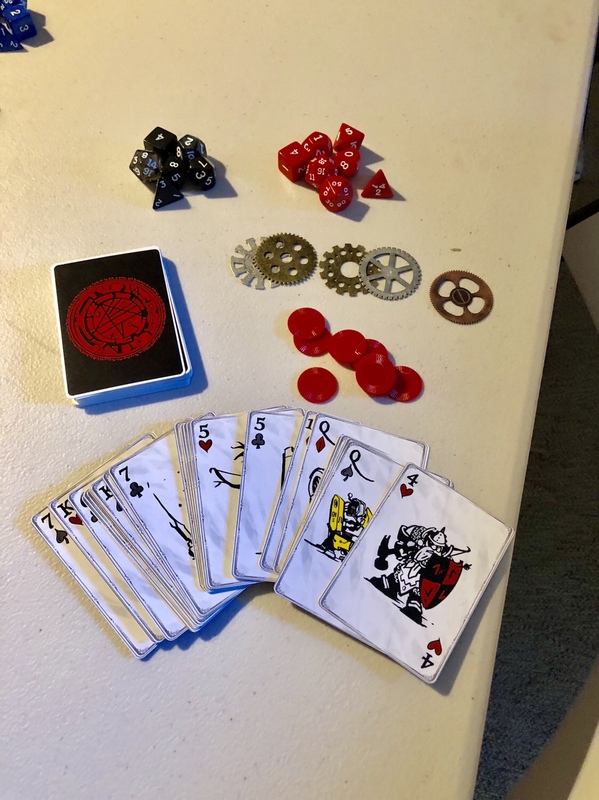 Essentially, this token allows a player to roll their d12 with either their weapon or magic damage so there is no reason to have any special d12s at the table – they use their d12s in their dice pool. The Benny, however, is used to either re-roll a bad d20 roll OR it can be cashed in prior to rolling to gain Advantage on the next roll. Sometimes you roll and then just wish you could roll again and sometimes you want to cash in the Benny before the roll so that you can roll 2d20 (Advantage). 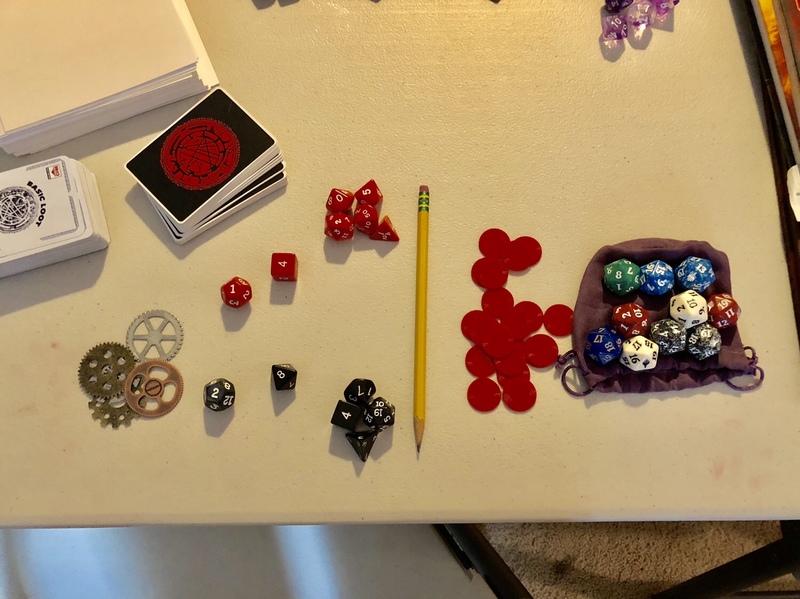 Because this adds another d20 to the roll, I use the little red chips to the right of the pencil for my Bennies and have a pile of d20s on hand to toss at players when they choose to cash in a Benny. I like this system since it allows players to use a Hero Token for Effort and Bennies for Attempts. I did like Hankerin’s continuous initiative, but I really like the deck of cards method that SW uses. I believe it adds more suspense and drama to initiative, plus, whenever a Joker comes up, everyone gets a Benny and everyone’s attempt for the round is easy! Besides, there are times in the game (quite a bit, actually) when it’s not really anyone’s turn because the group is discussing what their next action or direction should be. 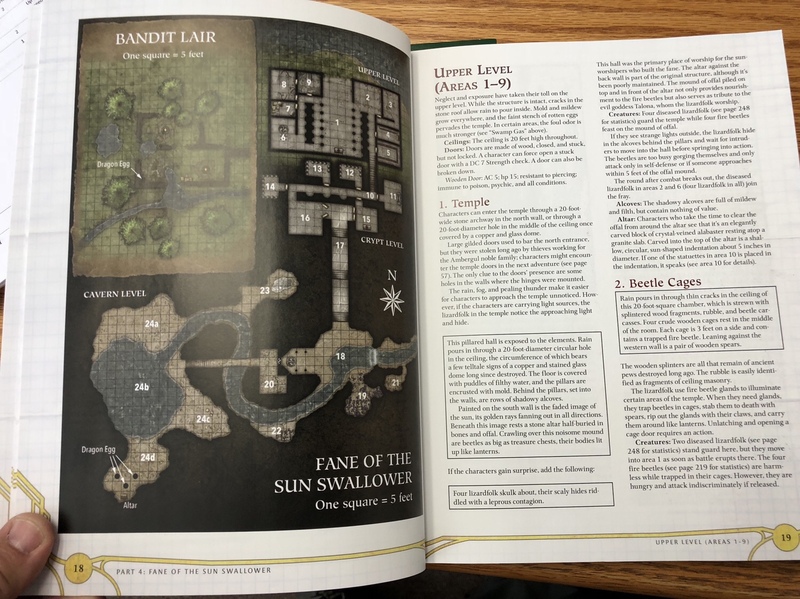 I chose to use the adventure called “Fane of the Sun Swallower” from the D&D Next book entitled “Ghosts of Dragonspear Castle”. This is a great little dungeon with some cool magic items. The first thing I did was go through and make my own little set of Loot cards that match all the magic items. Just find all the entries for Treasure, and make your own cards. I used half of an index card and drew little pictures. 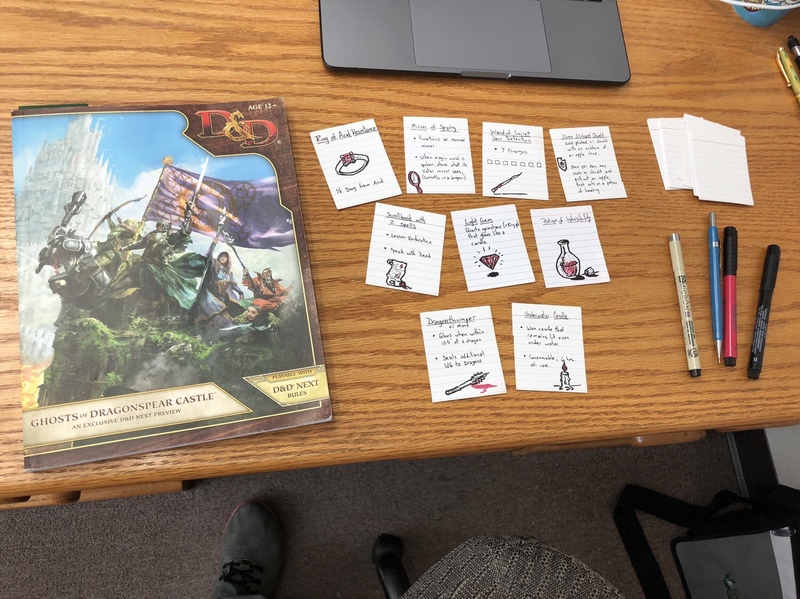 My boys seem to love the tactile nature of getting a card rather than writing down the item on their character sheet. 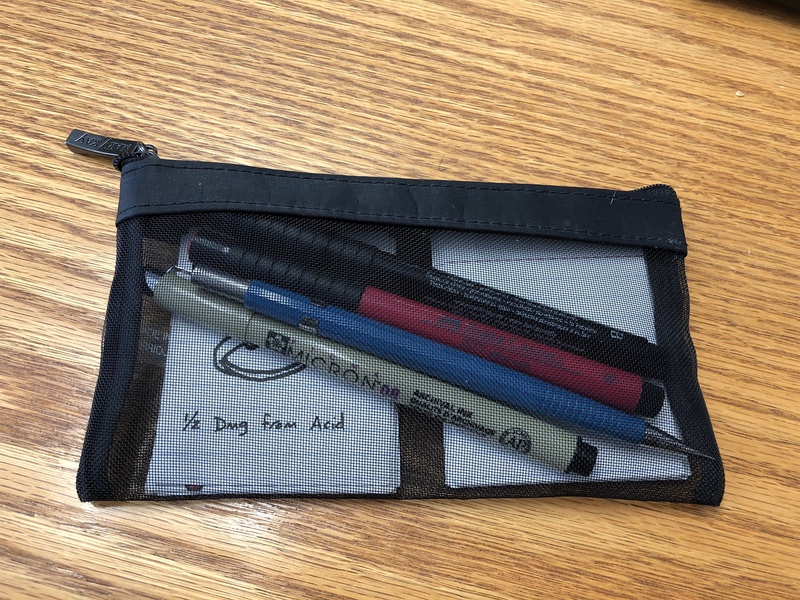 I made a little Loot bag so I could create more as the need arises. 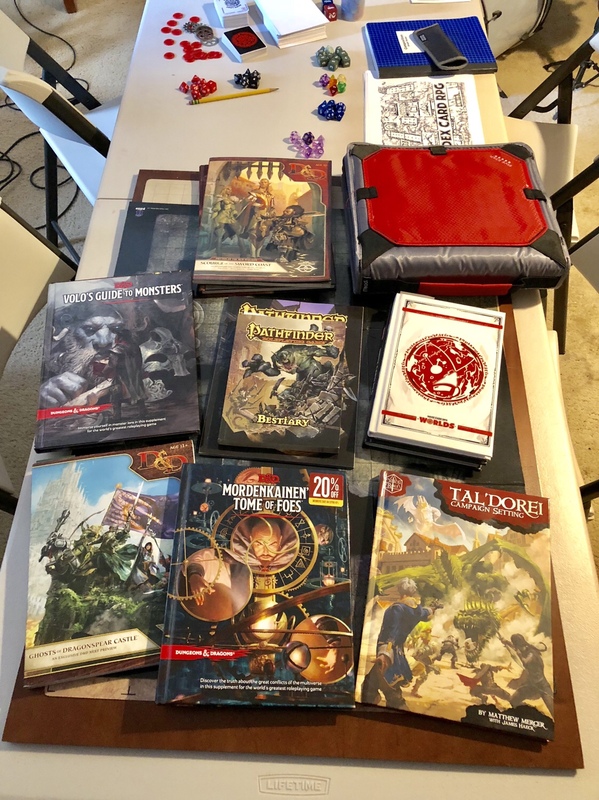 Besides my recent acquisition of both ICRPG books, I also recently got the Tal’Dorei campaign book and “Mordenkainen’s Tome of Foes”. 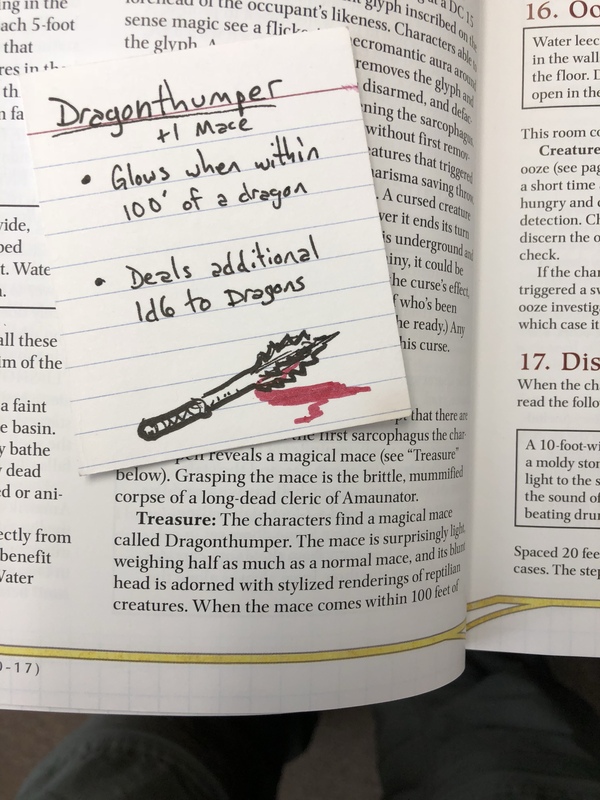 I noticed in both Ghosts of Dragonspear and Mordenkainen’s the following pictures that all harken back to the original cover of the Player’s Handbook. 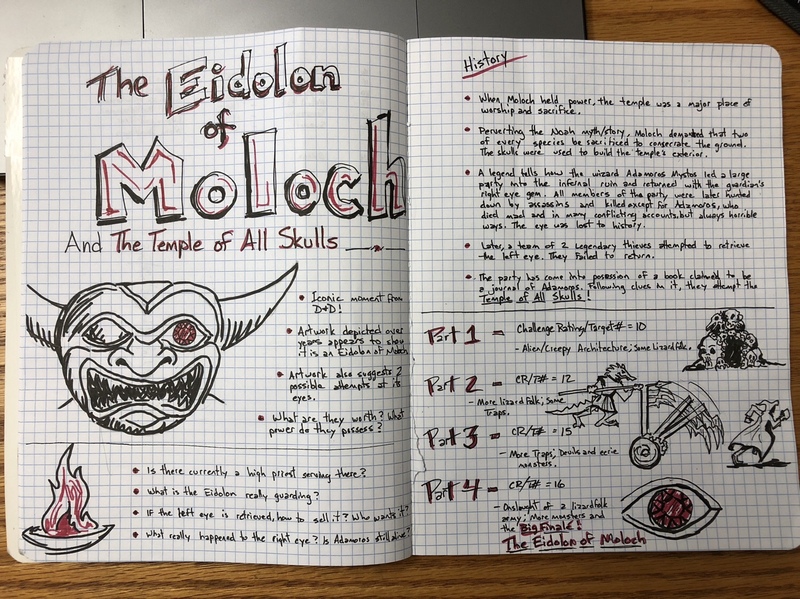 So, I created an ICRPG adventure that has the heroes going to retrieve the left eye of the statue. It is called “The Eidolon of Moloch”. As a dad who also games with his kids more often than adults, I’m really enjoying this series. 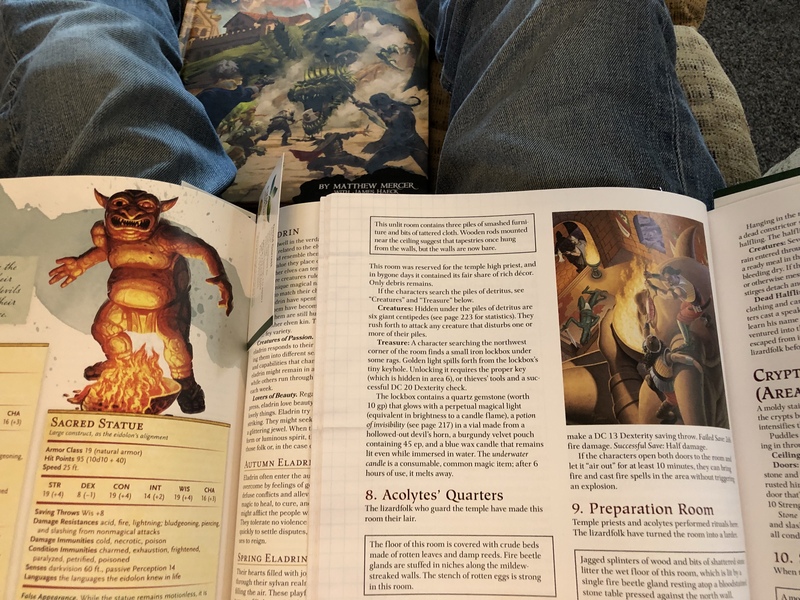 I’m definitely going to try some of these ideas while using ICRPG the next time I adventure with my kids.